The Labour Party haemorrhaged 60% of its membership between 1997 and 2007 according to their own figures published by the Electoral Commission. Labour's membership stood at just under 177k at the end of 2007 after losing 6,000 members that year. UKIP's membership, by comparison, is about 10% of that figure and rising. The Labour Party is supposed to be the second largest party in the UK and Her Majesty's Loyal (stop sniggering) Opposition. Labour has also managed to reduce some of its crippling debt that it racked up with the same financial mismanagement that it employed to destroy the economy. They reduced their £25m debts to £17.9m last year but still have £11m of loans due to be repaid this year. Almost £1m of Labour's debts are owed to the unions, partly from the unions directly but mostly from the Unity Trust Bank which is owned by the unions and used to finance the Labour Party whilst keeping the level of donations down. So what about donations? Who paid the Labour Party's bills in the 2011/12 financial year? Unsurprisingly, the Labour Party was rescued from bankruptcy once again this year by the "generosity" of the unions passing on the millions of pounds of taxpayers' money they get every year accounting for 53% of Labour's income. The second biggest donor to the Labour party was the taxpayer, contributing a further third of their income bringing the taxpayer funding of the Labour Party to 86.2%. Personal donations to the Labour Party came to almost £972k whilst donations from Labour Party branches around the country was just shy of £474k. Identifying where the branch donations originated from is a mammoth task and not one I intend to undertake but donating money via branches is a common way for big donors to conceal the extent of their party funding - it is likely to consist of high value personal donations, locally-based big business and unions. Companies donated just over £438k to the Labour Party and lobbyists donated nearly £209k. The NOtoAV campaign donated £192k to the Labour Party, £114k of which was taxpayers money from the Electoral Commission. GovNet, a litigious company that appears to be in the same vein as Common Purpose that allegedly made inappropriate donations to MPs, has given almost £11k to Labour and an industry group set up by Labour to lobby itself gave them £6k. * There are three donations that are questionable. Firstly, S.S.R. (Scotland) Ltd donated £2,250 to the Labour Party in cash on 12th July 2011 but the company hasn't filed accounts since 2010 and Companies House has published its intention to strike the company off the register in the London Gazette. Crow Craylor and Partners, listed as an unincorporated association, is Crowe Caylor and Partners Limited and has been a limited company since 2008. It is not clear how the Australian Labor Party fits the criteria of being based and carrying out business in the UK but they have donated almost £23.4k to the UK Labour Party. Hopefully the Electoral Commission can shed some light on whether these donations are permissible and reported correctly. The final set of donations of note come from the Co-operative Party, a shell political party used to funnel over £1m of funding from the Co-operative Group - owner of the Co-op supermarkets, Co-op Insurance, etc. - to the Labour Party both in direct donations (£111k in the 2011/12 financial year) and by sponsoring branches and MPs. Because the Labour Party is so good at hiding the true source of its income, it is impossible to tell how much of its income comes from the taxpayer but I would estimate that at least 90% of its income in 2011/12 ultimately came from the taxpayer. 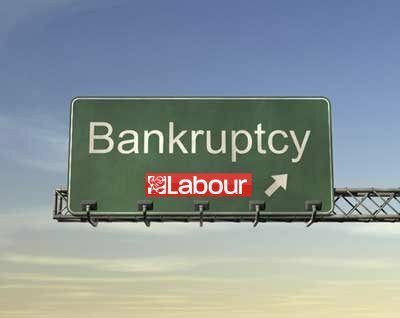 Without direct and indirect public funding, the Labour Party would be financially insolvent (having been declared morally and intellectually bankrupt years ago) and would have been wound up by its creditors by now. For analysis of the Conservative Party's donations and loans, click here.